President Trump plans to continue the War in Afghanistan. His reasons don’t make sense. Here’s why. I arrived at three fundamental conclusion about America’s core interests in Afghanistan. First, our nation must seek an honorable and enduring outcome worthy of the tremendous sacrifices that have been made, especially the sacrifices of lives. The men and women who serve our nation in combat deserve a plan for victory. They deserve the tools they need and the trust they have earned to fight and to win. Second, the consequences of a rapid exit are both predictable and unacceptable. 9/11, the worst terrorist attack in our history, was planned and directed from Afghanistan because that country was ruled by a government that gave comfort and shelter to terrorists. A hasty withdrawal would create a vacuum for terrorists, including ISIS and Al Qaeda, would instantly fill just as happened before Sept. 11. And as we know, in 2011, America hastily and mistakenly withdrew from Iraq. As a result, our hard-won gains slipped back into the hands of terrorist enemies. Our soldiers watched as cities they had fought for and bled to liberate, and won, were occupied by a terrorist group called ISIS. The vacuum we created by leaving too soon gave safe haven for ISIS to spread, to grow, recruit and launch attacks. We cannot repeat in Afghanistan the mistake our leaders made in Iraq. Third, and finally, I concluded that the security threats we face in Afghanistan and the broader region are immense. 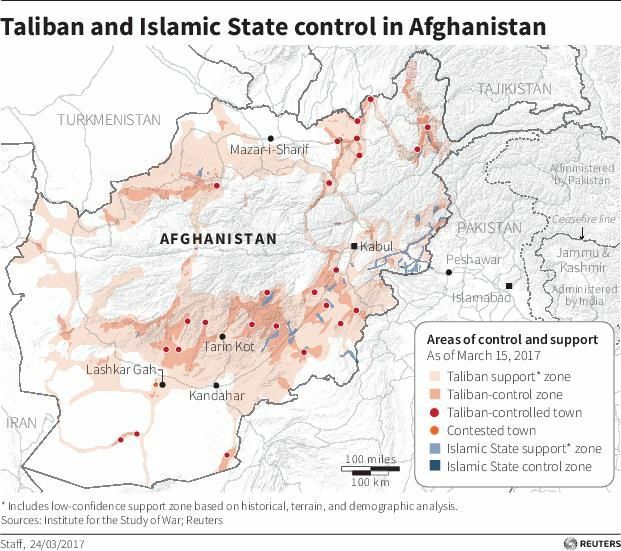 Today, 20 U.S.-designated foreign terrorist organizations are active in Afghanistan and Pakistan, the highest concentration in any region anywhere in the world. The first reason is a version of the sunk costs fallacy, the second reason is security, and the third reason is essentially a restatement of the second reason. Does it make sense to continue to fight the War in Afghanistan for security reasons? The War on Terror has or will cost the US government somewhere between $1.6 and $6 trillion, depending on how you measure. How many American lives do we think we save with that money? Let’s put it this way–how many 9/11 attacks do we think the War on Terror has prevented since 2001? On 9/11, terrorists killed about 2,977 people, excluding themselves. We’ve lost 6,831 Americans in the wars in Afghanistan and Iraq, about as many as we’d lose to just over two 9/11 attacks. If we didn’t prevent at least three 9/11 attacks, we’ve lost more Americans than we’ve saved. In the 16 years before 9/11, there were no terrorist attacks on Americans that were as bad as 9/11. But let’s say, for the sake of argument, that the world changed on 9/11 and became much more dangerous all of the sudden, and that if we had not spent trillions of dollars on the war there would have been a 9/11 every year. That’s 16 major terrorist attacks killing about 47,632 Americans. That would give us a net saving of 40,801 American lives over a 16 year period, or about 2,550 lives per year. How much money would we have spent saving each of those lives? If we average it, the War on Terror has cost somewhere between $100 billion and $375 billion per year since 2001. That would work out to between $39 million and $147 million per life. Let’s put those figures in context. In 2014, 14,249 Americans were murdered. Total state and local government spending that year was $2.7 trillion, and 7% of that money was spent on police and corrections. That works out to around $189 billion. Let’s throw in the $27.6 billion the Justice Department spent that year. For each person murdered, we spent about $15 million. Now of course, this is a gross oversimplification–we all know that the police and the justice department do not spend 100% of their budget preventing and investigating murders. But even if they did, they’d still only spend a fraction on each murder of what we would be spending to protect people from terrorism assuming that a 9/11 attack would otherwise happen every single year. The assumptions I’m making are extremely favourable to the president, and yet it seems like we’re spending way, way more on preventing people from dying from terrorism than we spend on preventing them from dying from murder. It gets worse. In 2015, total healthcare spending in the United States was $3.2 trillion. That year, 2,712,630 Americans died in total of all causes. Let’s assume that we spent every single healthcare dollar trying to save those people, and none of it on anyone else. If we did that, our healthcare budget would be about $1.1 million per fatality. The United States spends a lot more on healthcare than most countries. We spent 17.8% of GDP in 2015. In 2014, the UK spent about 9.1% of GDP on healthcare. (Despite that, British life expectancy is three years longer, but that’s neither here nor there). If we spent the same percentage the Brits spend, our healthcare budget would be just $605,000 per fatality. It doesn’t make sense to spend this kind of money protecting Americans from terrorism. Terrorists just aren’t that good at killing Americans. There are much bigger threats out there, like “other Americans” and “cancer”. If the president wants to save and improve American lives, there are many excellent public services that do a much more efficient job and could use the money. Efficiency gets a bum rap sometimes, but when we throw limitless sums of money saving very small numbers of lives, we invariably allow large numbers of people to slip through the cracks elsewhere. There’s nothing reasonable or compassionate about obsessing over terrorism deaths as if they were more tragic than other kinds of preventable suffering. Until we figure that out, American presidents will continue to throw good money after bad.